Thermoelectric materials have been a topic of massive research and development since a long time, as they follow the principle of converting waste heat into usable electricity. Usage of this niche technology in various end-user industries such as automobiles, industrial, and healthcare might result in proper utilization of energy, which would eventually result in decreasing the demand for energy resources. Various environment regulations lead factories to cut down on their production limits due to excessive greenhouse gas emissions. Thermoelectric materials contribute in the reduction of greenhouse gas emissions which has become a major area of focus in the global scenario. Although at an emerging state, thermoelectric materials have been used in several pilot projects to test their feasibility and efficiency. Many companies such as Panasonic Corporation and Hitachi Ltd., among others are actively engaged in the research and development of thermoelectric materials given their high potential. Bismuth telluride, lead telluride, and silicon germanium are some of the thermoelectric materials widely used in the end-user industries. Bismuth telluride is the traditionally used thermoelectric material owing to its features. It is an alloy made of bismuth and telluride. It could be found in various forms such as in pieces, powder, lump, ingots, and chunks, among others. It can be used as a thermoelectric material and utilized in power generation device or cooling modules such as refrigerator. It also finds its application in topological insulators. 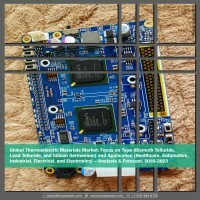 The report is a compilation of different segments of the global thermoelectric materials market, including market breakdown by type, application, and geographical areas. Herein the revenue generated from the types (bismuth telluride, lead telluride, and silicon germanium), application (healthcare, automotive, industrial, electrical and electronics, and others), and geographies (North America, Europe, Asia-Pacific, and Rest-of-the-World) are tracked to calculate the overall market size both in terms of value ($thousand) and volume (metric tons). While highlighting the key driving and restraining forces for this market, the report also provides a detailed summary of the global thermoelectric materials market. It also includes the key participants involved in the industry at the relevant sections. The report further includes a thorough analysis of the impact of the Porter’s Five Forces to understand the overall attractiveness of the industry. The most commonly used strategy for developing a better hold on the market has been through business expansions. Moreover, the company profile section highlights significant information about the key companies involved along with their financial positions, key strategies, and developmental activities in recent years. Further, the report includes an exhaustive analysis of the geographical split into North America, Europe, Asia-Pacific (APAC), and Rest-of-the-World. Each geography details the individual driving and restraining forces in addition to the key players from that region. This report is a meticulous compilation of research on more than 100 players in the global thermoelectric materials market and draws upon the insights from in-depth interviews with the key opinion leaders of more than 50 leading companies, market participants, and vendors. The report also profiles approximately 15 companies with their financial analysis, SWOT, and product portfolio. The company profiles in the report include Hitachi Ltd., Panasonic Corporation, Norilsk Nickel, EVERREDtronics Ltd., Ferrotec (USA) Corporation., Jingyi Metal Material (Shanghai) Co., Ltd., KELK Ltd., Marlow Industries, Inc., P&N Technology (Xiamen) Co., Ltd., Reade International Corp., Sigma Aldrich Corporation, TECTEG MFR., TEGma AS, Thermonamic Electronics(Jiangxi) Corp., Ltd., and TOSHIBA MATERIALS CO., LTD.
7.5 Jingyi Metal Material (Shanghai) Co., Ltd.
7.9 P&N Technology (Xiamen) Co., Ltd.
7.15 Thermonamic Electronics(Jiangxi) Corp., Ltd.
7.16 TOSHIBA MATERIALS CO., LTD.
Table 7.2 Ferrotec (USA) Corporation. Table 7.4 Jingyi Metal Material (Shanghai) Co., Ltd.
Table 7.6 Marlow Industries, Inc.
Table 7.8 P&N Technology (Xiamen) Co., Ltd.
Table 7.14 Thermonamic Electronics(Jiangxi) Corp., Ltd. The increase in the global population coupled with the boost in the economic growth owing to the modernization has led to an increase in the energy consumption worldwide. The major source of the energy comes from conventional resources which not only raises sustainability concerns but also results in adverse environment impact such as climate instability and increase in the carbon dioxide levels. As per the “Global Energy & CO2 Status Report 2017” report by International Energy Agency (IEA), the source of 72% of the energy came from fossil fuels and a growth of 1.4% was witnessed in the emission of energy-related carbon dioxide in 2017. These facts emphasize on the extent of the issue that needs to be addressed with the help of proper energy harvesting. The upsurge in the energy consumption also impacts the cost of the conventional resources. Therefore, proper utilization of resource is a major topic of research in ongoing days of economic expansion within the countries. A large chunk of heat is wasted in the process of conversion energy into usable electricity or in any other form. Thermoelectric technology comes up with a solution to minimize this wastage of heat. Thermoelectric materials have the potential to reduce energy consumption by converting waste heat produced during the process of energy utilization into usable form of electricity. It is anticipated that thermoelectric materials market would have enormous opportunity to grow owing to the initiation of several advancements in the end-user industries where the materials are widely used. Thermoelectric materials have been a topic of massive research and development since a long time as they follow the principle of converting waste heat into usable electricity. Usage of this niche technology in various end-user industries such as automobiles, industrial, and healthcare might result in proper utilization of energy which would eventually result in decreasing the demand for energy resources. Bismuth telluride, lead telluride, and silicon germanium are some of the thermoelectric materials widely used in the end-user industries. Bismuth Telluride is the traditionally-used thermoelectric material owing to its features. It is an alloy made of bismuth and telluride. It could be found in various forms such as in pieces, powder, lump, ingots, and chunks, among others. It can be used as a thermoelectric material and utilized in power generation device or cooling modules such as refrigerator. It also finds its application in topological insulators. In terms of value, the global thermoelectric materials market is expected to grow at a CAGR of 8.49% during the forecast period 2018-2023. The factors driving the demand of thermoelectric materials in the global market are improved vehicle fuel efficiency using thermoelectric modules, increasing awareness of green energy, rising awareness by government officials, and rapid commercialization of thermoelectric generators in the automobile industry. The automobile industry is amidst a revolution where the industry is accelerating its pace toward becoming more sustainable and greener. Proper utilization of waste heat in the automobile industry is another concern that has been gaining traction since a long time. As per the American Society of Mechanical Engineers (ASME), the heat energy lost due to the internal fuel combustion in the automobiles is almost 65%. Thermoelectric generators with the help of thermoelectric materials can convert waste heat into electricity. Many automobile industries have been actively participating by including technologies that would reduce heat wastage. Ford, for example, is incorporating bismuth telluride as a thermoelectric material for its thermoelectric generator to minimize its fuel energy wastage. Volvo Group have started the RENOTER project for a duration of 3 years with 8 partners, whereby targets are set for permissible heat wastage for different types of vehicles. In terms of value, in 2017, bismuth telluride accounted for the largest share of 67.36% in the global thermoelectric materials market. The high use of bismuth telluride in thermoelectric devices and modules for waste heat recovery, refrigeration, electronics cooling, thermal comfort, and others is expected to propel the demand of bismuth telluride in the thermoelectric materials market. Since the demand for energy consumption is accelerating with the depleting fuel resources, thermoelectric material and their usage has become a topic of interest among several institutes and governments. Universities, such as The University of Queensland, have been actively engaging in enhancing the performance of bismuth telluride at several temperatures to use it in various devices and make it as energy efficient as possible. The industrial segment dominated the global thermoelectric materials market in terms of value with a market share of 41.56% in 2017. Owing to the ability of thermoelectric materials to harness the waste heat from various power plants and effectively convert them into electricity, the demand of thermoelectric materials such as bismuth telluride is expected to grow during the forecast period. Asia-Pacific region occupied the highest share of 44.98% in 2017 which is further expected to increase to 45.60% by 2023. China is the highest revenue generating country in Asia-Pacific, and it is also expected to show the fastest growth during the forecast period. The country has many manufacturers of thermoelectric materials and devices and has been promoting the use of TEGs. The growth of these TEGs has further enhanced the consumption of thermoelectric materials in the country. Additionally, several ongoing research activities in various institutes in the country are expected to propel the demand of thermoelectric materials market in the country. The automotive segment in the China thermoelectric materials market is expected to be the fastest growing application during the forecast period. There are research and development activities ongoing to use thermoelectric materials for automotive applications such as cooling and heating seats and harnessing the waste heat to generate electricity for various electrical activities in the country.